Today we had the honour of celebrating my parent’s 60th wedding anniversary. They had a celebration after the morning service in their church near Orillia. They married in 1955 and raised 5 boys. After the celebrations we had a choice of heading home down highway 11 from Orillia or going to Coldwater and getting on the 400. With an historical mill in Coldwater the choice was simplified. 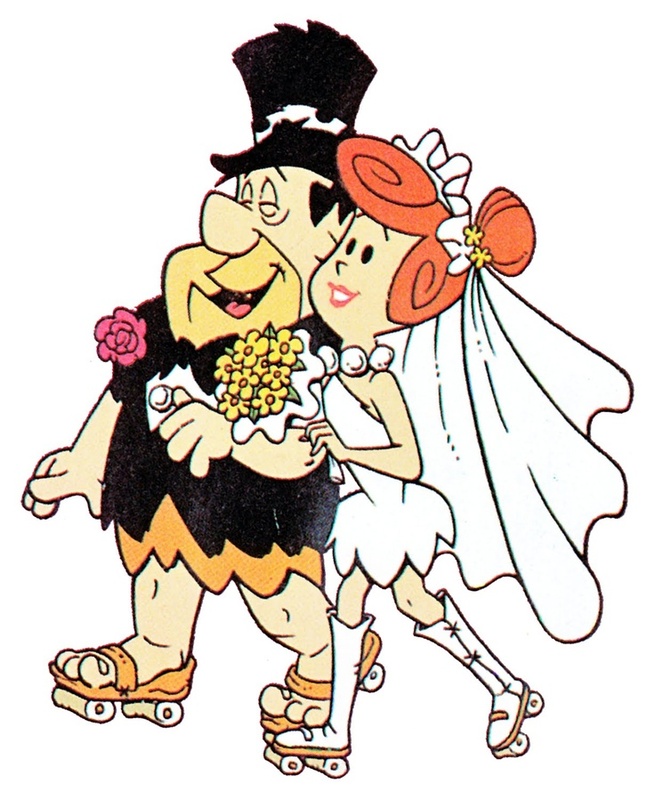 The picture below is just a quick sketch of what my mom and dad may have looked like on their wedding day. In the early 1830’s the government set up a 9,800 acre reserve for native peoples in the area that is now known as Coldwater. About 500 Ojibwa moved into the reserve and started to grow grain. In 1832 over 500 bushels of grain were harvested and the need for a grist mill became apparent. The government thought that the mill would provide employment for some of the local people and so contracted to have mills constructed near the rapids at Coldwater. Although a government project, the mill appears to have been funded by the natives themselves. A saw mill was constructed first and by July 1833 it was busy cutting the wood for the grist mill. By April 1834 the grist mill was completed and opened for business. Within 2 years the natives decided that milling was not for them and they leased the mill to Miles Stennet and moved to Christian Island in Georgian Bay. By 1849 they decided to sell the mills and thus began a series of ownership changes. The saw mill was closed in 1874. In 1880 the mill changed hands again and extensive modifications began. The third story was added and by the end of the decade the undershot water wheel was replaced with more efficient turbines. 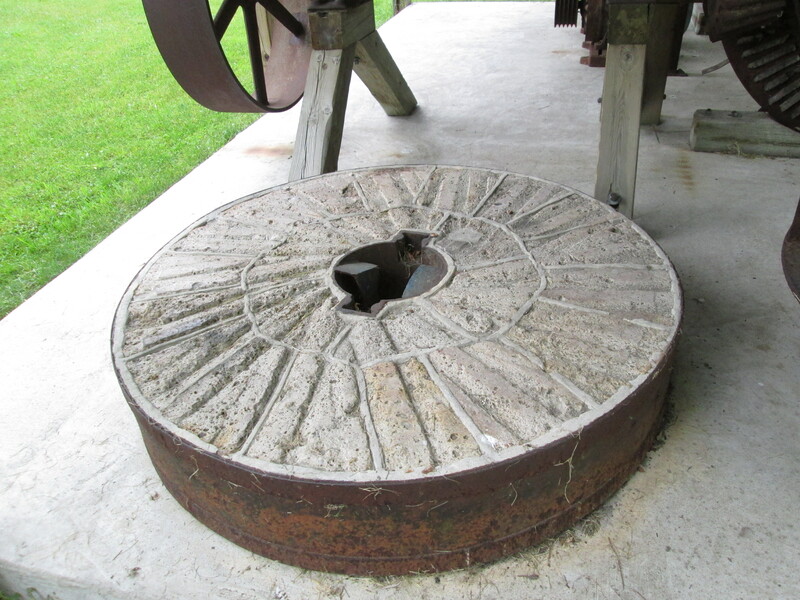 This mill stone is one of two original ones brought here in 1833 from France. This type of stone is known as a French Burh Stone. It is made up of segments of burh stone which are cemented together and held in place with a band of iron. This stone is about 1.5 metres across and weighs 760 kg. The flat surfaces are called “land” and the grooves are called “furrows”. The furrows move the flour toward the outside of the stone as well as letting air in to reduce the heat that is created during grinding of the grain. A stationary bedstone and a spinning runner stone made up a pair, or run, of stones. The original stones at Coldwater were removed in 1889 and replaced with metal rollers. 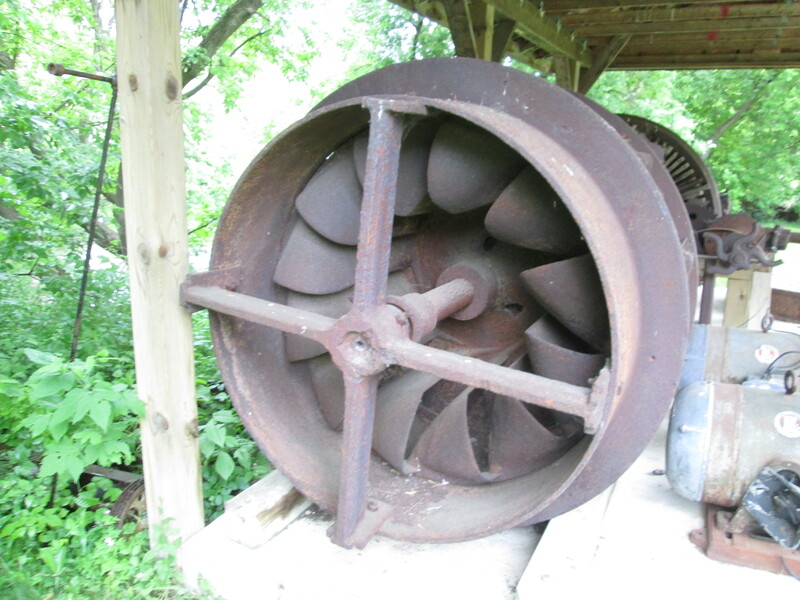 The first turbine was a small Francis turbine which was replaced in about 1906 by a larger one manufactured by Barber Hydraulic Turbines of Meaford Ontario. The turbine weighs 3100 pounds and has a maximum speed of 81 rpm. It was operated with a 10 foot head of water to produce the energy to operate the mill. The turbines from the mill were put on display when the mill was restored in 1995. Water entered through this end of the turbine to rotate the shaft that contained the cast bevelled gear. The photo below shows the turbine and shaft connected to the large beveled gear. 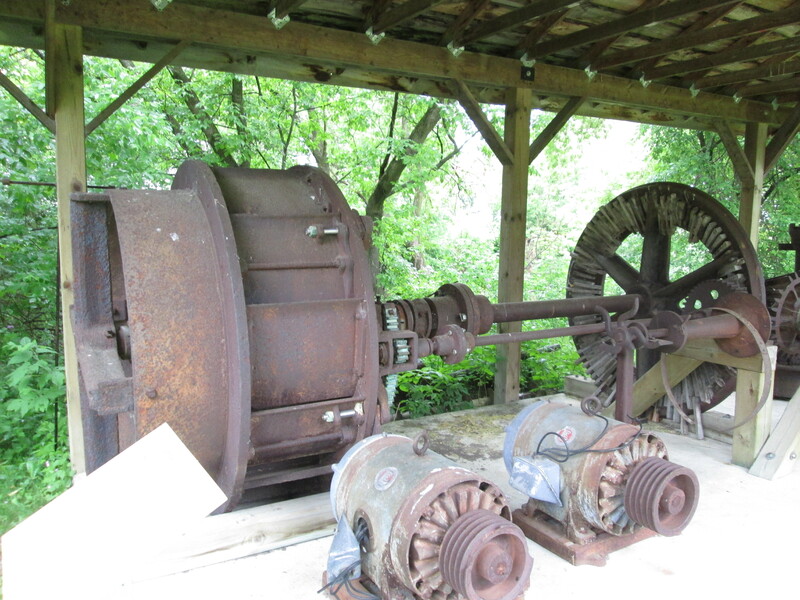 Two small electric motors for generating electricity were installed in 1955 and they are on display here as well. 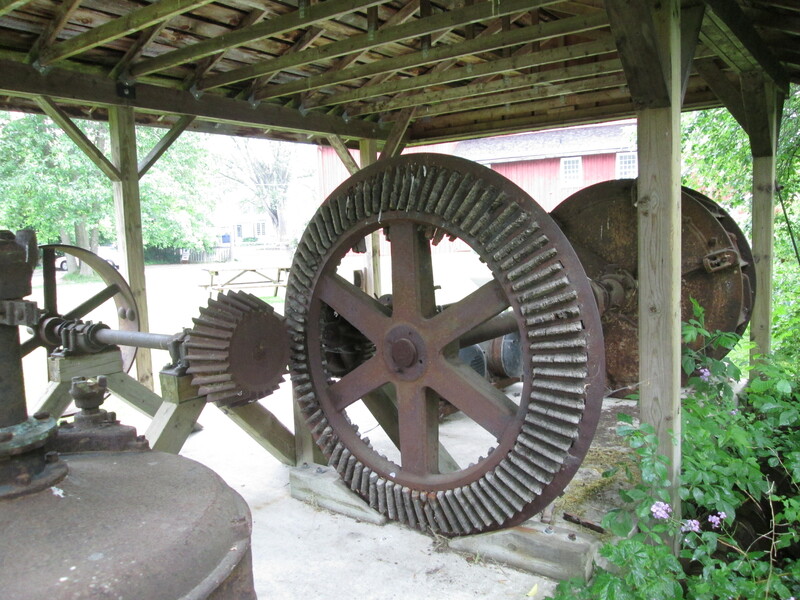 The beveled gear had 84 wooden teeth. Wood was used for the teeth for several reasons. From a noise and vibration point of view these were much quieter. They also reduced the risk of a spark which could set the dusty old wooden building on fire. Lastly, they provided a predetermined failure mode if the wheels got jammed. The wooden teeth would break and not the steel ones making repairs easier and faster. 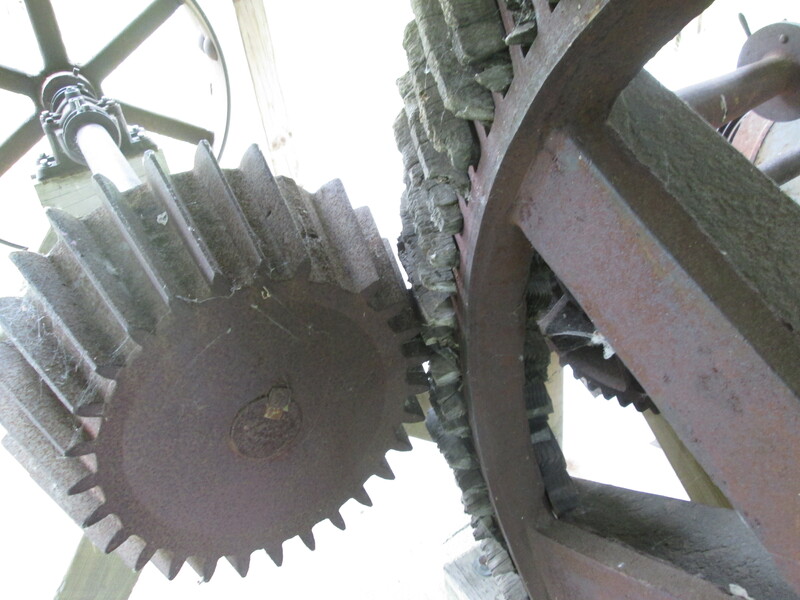 The smaller beveled gear rotated the drive shaft that transferred power to the mill stones. In 1924 the steel rollers for making flour were removed and the mill became strictly a feed mill providing fodder to the local farmers. When the mill adopted the steel rollers for flour making in 1889 they marketed their product under the name “Jersey Lily” as can be seen in the cover photo. 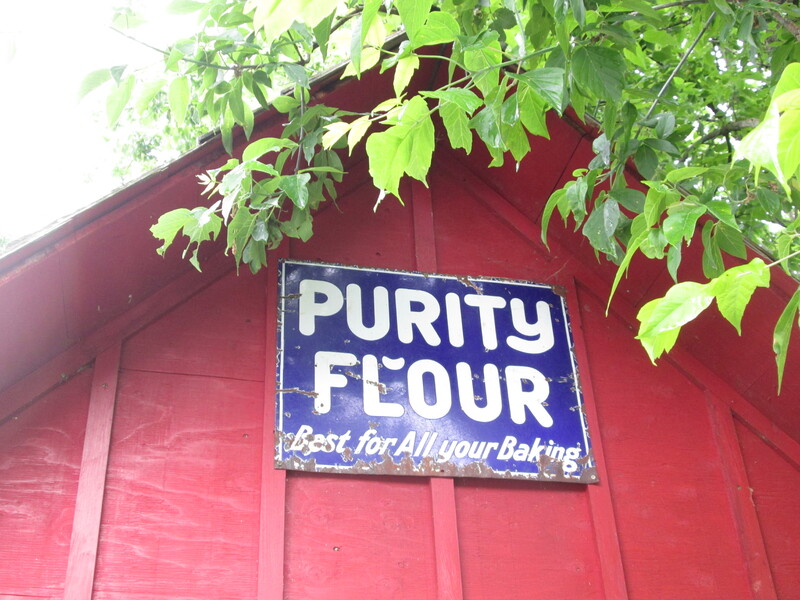 The shed behind the mill has a Purity Flour sign which would be more at home in Manitoba. In 1955 the mill was converted to electrical power and the turbines shut down for the last time. They sat idle in the mill race until 1983 when they were removed. Changes in farming and the introduction of personal feed mills on farms led to the mill closing in 1994. Arend and Connie Meiling had owned the mill since 1989 and now considered tearing it down and selling the lumber. 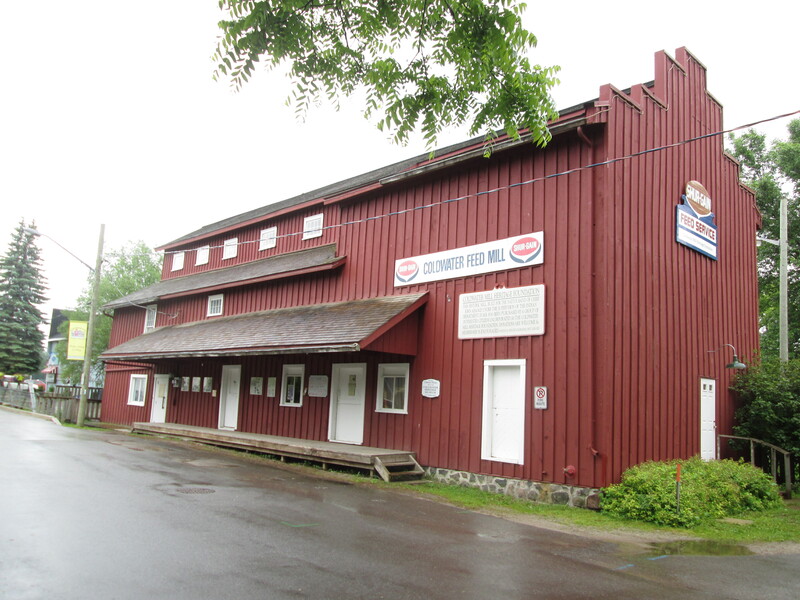 The Coldwater Mill Heritage Foundation got involved and bought the mill. In 1995 they started an extensive restoration of the mill which is now protected under an architectural and historical designation. This entry was posted in Mills and tagged Coldwater Mill, Jersey Lily FLour, Purity Flour, turbines on June 19, 2015 by hikingthegta.